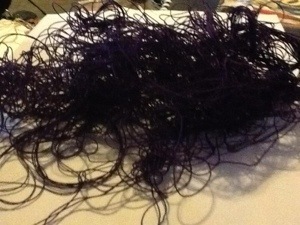 Oh What a Tangled Thread We Weave…. When we toss Egyptian cotton with ease. WARNING: This post contains graphic pictures of mishandled thread. Not for the faint of heart. I admit, I have issues. Those who know be can attest that I have more than my fair share. Luckily for you, since this blog is about tatting, we can skip over 95% of them. I have already shared my obsession with Aerlit shuttles and my quest to get one of each color. 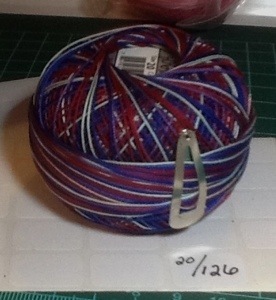 After shuttles, my OCD moves on to threads. Since I am bearing my soul here, I must confess that there is a part of me that wants a collection that includes every color of Lizbeth size 20 available. That is over 179 different colors. (Color Chart) The reasonable part of my brain tells me how ridiculous that is, the creative artistic side is screaming “NEED! WANT! NEED! WANT! NEED! WANT!” I was lucky though, when I started putting together my collection, a local craft store was closing out all their Lizbeth so I was able to buy a bunch of variegated colors cheap. Another national craft chain has a 40% off coupon every week. For awhile, I just stopped in there whenever I was going buy and picked up a ball. If I was to count, which I wont, I would estimate I have about 50 different colors. When you have that much, you need a way to organize it, or chaos will abound. 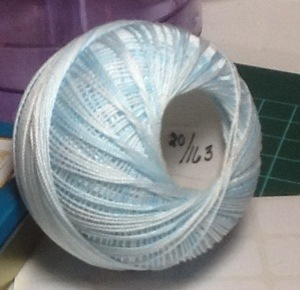 Last week, I purchased 3 new balls of thread and it is time to add them to my Snap-Ware storage containers. I could just toss them in together and let them party all night but I have control issues so that doesn’t work for me. I know some people leave them in the nice plastic bag they come in, drawing the thread thru the hole right below the seal. I tried that but the krinkling sound of the bag annoyed me. Instead, after spying on other tatters, and adding some ideas of my own, I came up with the following check list for each ball of thread I buy. Step One: Clip it up! The first thing I do once I take a ball of thread out of its protective baggie, is add a little girls hair clip to hold the end of the thread in place. These clips can be purchased anywhere, in many different designs. My co-blogger Natalie, who I stole this idea from, has little heart shaped clips that are adorable. The average cost is less than 10 cents each. I have an excel file that lists every color of thread I have so I don’t buy doubles. It includes the color name and number, amount, and a way to mark the color if I need to buy more. I can then export the data into a PDF that I can send to my mobile device and take with me to the store or guild meetings. I know this seems redundant since Lizbeth labels each ball but it has been my experience that the Lizbeth label falls off once you get about halfway thru the ball. To prepare for that eventuality, I add a secondary label to the inside of the cardboard tube holding the ball in shape. You can use any labels you want, but you need to make sure they are NOT reposition-able. If you can move the label around, there is a good chance that over time and use, the label will fall off. Avery Mailing labels cut in half work great. 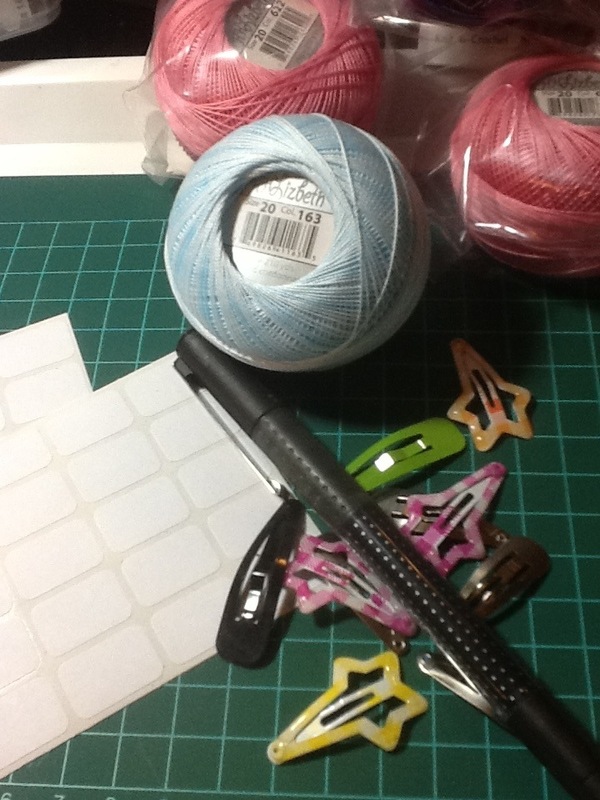 I use the following key on my labels: Thread size/ Thread Color number. I use both in case I ever start collecting other thread sizes (my husbands worst nightmare) I will know what is what without having to guess. 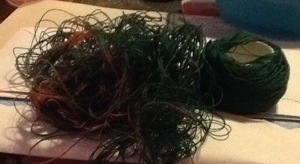 Once all that is done, the thread is ready to play nicely with the others. Now, you don’t have to follow these steps but you must tame your threads and show them who is boss. We all know what happens when thread is left to its own devices…….